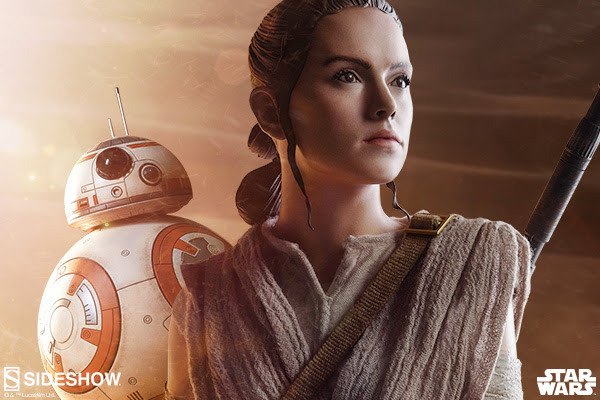 Sideshow has come out with a gorgeous Rey premium format figure. The work on this collector's piece is amazing. She is 20 inches tall and has incredible detail. You can even pair her off with a BB8. You can find her here. She will run you $479.99 but to collector's that is worth it. I'm very excited to see Rey's journey in the next film. Hopefully she will start Jedi Training. Her skill with a light saber seemed pretty good as a beginner. Sideshow also sells the BB8. This item will be released around November 2017. In the land of collector's figures Sideshow is top of the line.